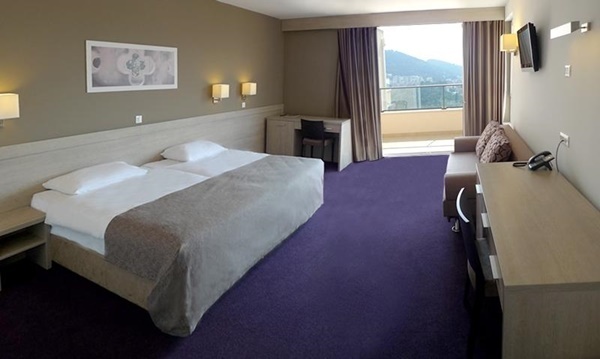 This newly opened hotel located at the top of Gruz neighbourhood makes a great base for exploring Dubrovnik. Hotel is located away from the Old Town but offers hotel shuttle bus for a reasonable price. There is also a city bus No.3 that takes you to the historic centre. 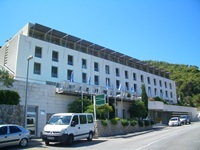 Hotel offers accommodation in 116 double rooms, triple rooms and family rooms. Rooms are modern and comfortable and each room has a direct phone line, satellite TV, Wi-Fi Internet connection, mini bar, safety deposit box, hair-dryer. 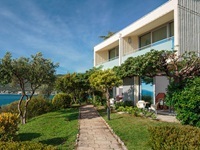 Most of the rooms have a balcony overlooking Gruz bay and nearby Elaphite islands. Free internet is available throughout the hotel. For visitors arriving by car, there is a garage free of charge for the use of guests. A rich buffet breakfast is daily served in the restaurant "Sunset" as well as variety of local dishes for dinner. There is also aperitif bar - a great place for light refreshments and beverages. If you want to stay fit during your holidays, there is a fitness centre. Guests can choose from variety of massage treatments, relaxing in jacuzzi or just swimming in outdoor pool. Hotel Adria has a meeting room with capacity up to 50 people and conference hall with capacity up to 150 people. Both have the latest equipment and provides its clients possibility of organising the most demanding gatherings and all the necessary content.